Please ignore the advertising slogan "What happens in Las Vegas stays in Las Vegas." It's not true. Las Vegas is the crossroads of America. What happens here is happening everywhere. And I've uncovered the biggest liberal scam in America -- going on right here in Las Vegas. It revolves around my home community in Henderson. I live in the exclusive Anthem Country Club. There are about 1,500 beautiful homes behind the gates of Anthem. Together, these homes are worth around $1 billion -- in just one country club in one Las Vegas suburb. What's the amazing appeal of Anthem Country Club? It's got a big beautiful wall around it. And thick iron gates in front are protected by armed guards. The result? There is virtually no crime inside walled, gated, armed Anthem. Life is good behind the gates of Anthem. In the rest of Las Vegas ... not so much. In the rest of Vegas ... lots of crime, gang bangers, drugs, car-jackings, and home invasion robberies. Proving walls and gates and lots of armed guards are a good thing if you want your family to be safe. But wait. My Anthem community recently added yet another feature to keep our residents safe. Every vehicle entering our gates must show a government-issued photo ID or they will be denied entry. Guess who's my neighbor, just steps away from my home? Former Sen. Harry Reid. The one and only. He could have chosen anywhere in Nevada or America to retire. But he didn't. He chose the protection of fortress Anthem for his family. There are many lessons we can learn from studying Anthem Country Club. Lesson No. 1: If you want your family and children to be safe, BUILD A WALL -- preferably a wall that is also surrounded by armed guards. The Vatican understands this lesson. Every celebrity in Hollywood understands. All the wealthy politicians in Washington, D.C., understand. All the big-shot media executives understand. Bill Gates, Warren Buffett and George Soros all understand. Barbara Streisand, George Clooney, Sean Penn, and Madonna all understand. They are protected by big walls, sturdy gates, and armed guards. Lesson No. 2: Liberal Democrats are hypocrites. All the liberal bigmouths who denigrate the wall live behind walls and gates. None is a better example than Reid, former chief water carrier and bottle washer of President Barack Obama. 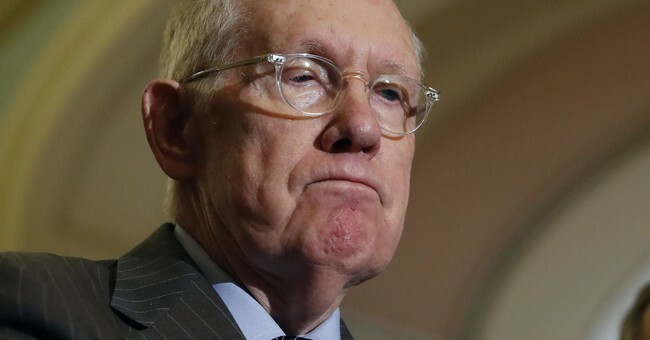 Reid spent his entire Senate career fighting viciously against a wall. Reid argued walls were terrible and unnecessary things. So, why did Harry choose Anthem? Because he loves his family. That's why we all want a wall at America's southern border. To protect our country and our children from bad people, drugs, disease, and violent crime. Welcome to the neighborhood, Harry. Can I bring a cake by? Lesson No. 3: Liberals lie about everything. Liberals don't just use walls to separate themselves from the very poor and illegal alien voters they count on to elect them. They use limos and private jets and send their children to lily-white private schools where they'll never be around gangbangers or illegal aliens or Muslim refugees or disease. Lesson No. 4: Guns must not be as bad as liberals claim. Because liberals may argue against gun ownership, but at the same time, they have armed guards protect them. Lesson No. 5: The argument against voter identification is a total scam. How do all those gardeners, maids and pool cleaners drive through the gates of Anthem every day? The answer: They all already have a government-issued photo ID. So I guess it's a lie when liberal politicians claim that poor people and minorities don't have a photo ID or that it's too difficult for them to get or that it's "racist" to ask them for it. Voter ID is an issue because liberals want election fraud. They can't win without it. They want illegals to be able to vote by the millions for Democrats. Folks, we're being scammed. But not just any scam. This is the greatest scam of all time. Anthem, my beautiful, safe community, is the proof. What happens here in the suburbs of Vegas, is happening everywhere. My advice? BUILD THE WALL.